This Snowbee innovation has become a top seller and solves the problem of what to do with the catch, when you return to the car, with a Bass Bag full of slimy, dripping fish! 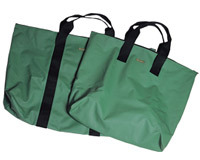 Made from our tough PVC/Nylon/PVC material, with welded seams, guaranteed 100% waterproof. The smaller size is ideal for a Bass Bag full of fish. The larger model will swallow boots, waders, waterproofs, landing nets, or whatever else you care to throw at it! Tough zip across the top, with strong Nylon webbing carrying handles. A neat, Neoprene reel case to help keep your multipliers protected. The full length cover flap, allows the reel case to be used, even with the reel attached to the rod. Available in two sizes. 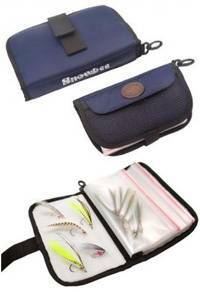 Our new Fly Wallets offer the serious saltwater fly fisherman huge storage capacity for large saltwater flies. Each Wallet holds 12 Self-seal bags, each capable of holding 10-20 large saltwater flies. Thats over 200 flies, enough for an entire trip, in just one wallet! Imagine how many conventional fly boxes you would need for that! These sets of bags are removable, so you can keep spare sets, pre-filled with flies for different species. On the front of the wallets is a mesh pocket for tools, leaders etc. There is a belt loop to carry on the waist, or a clip to attach to any convenient D-ring.